Primeiro álbum de Marlene Dietrich, lançado em 1951, todas as canções são cantadas em alemão. O álbum foi relançado em LP 12" com o nome de Lili Marlene e foram adicionadas mais 4 faixas: "Das Hobellied", "Du Liegst Mir im Herzen", "Muss I Denn", "Du Hast die Seele Mein". O álbum nunca foi lançado no formato CD, mas todas as faixas em sua ordem original foram incluídas na coletânea: The Cosmopolitan Marlene Dietrich,lançada em 1993. There were two Battlefields in the second World War. One was the front lines where the physical combat took place and the second was the furiou, bitter battle of propaganda. 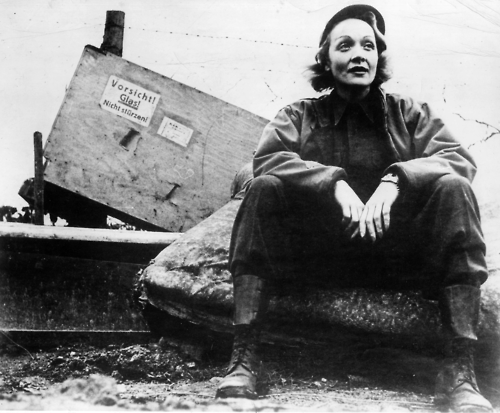 Marlene Dietrich was one of the very few people who served on both battlefields. The glamorous Miss Dietrich abandoned her fabulous career and threw herself whole-heartedlyinto the entertainment of front line troops. For three years the woman whose name was synonymous with beauty , luxury, and the height of fashion spent days and nights careening around the front lines (often under fire) in jeeps,on motorcycles and even afoot to bring entertainment and sunlit brightness of her personality to the front line G.I.’s. Meanwhile, the Office of Strategic Services was finding it difficult to reach na audiencein enemy territory with messages explaning the true aims of the Allies and the democratic processes by which they hoped to achieve them. The OSS relized that na incentive had to be offered to people in countries under Nazi rule to make them run the risk of tuning in the illegal or “underground” radio. And then came the inspiration: why not let the Germans hear one of the most magnetic personalities in the world, one of their own people singing American songs in German? The OSS realizes that Marlene Dietrich was busy entertaining front line troops but would she have time to make some records in German, of American songs? Miss Dietrich would. A lyricist named Lothar Metzl made translations of the songs overnight and between flying visits to the front Marlene Dietrich made these records, slanted directly at the German people in her own highly individualistic, inimitable style. These songs went to war, did their work and vanished into the O.S.S. files at Washington. Miss Dietrich, however, had copies of the recordings, andplayed them for Mitch Miller. Hefelt they were the best she had ever made, and asked her to remake them for us. The result is this collection, a remarkable combination of completely personal popular singing and a working demonstration of part of the propaganda battle of World War II. 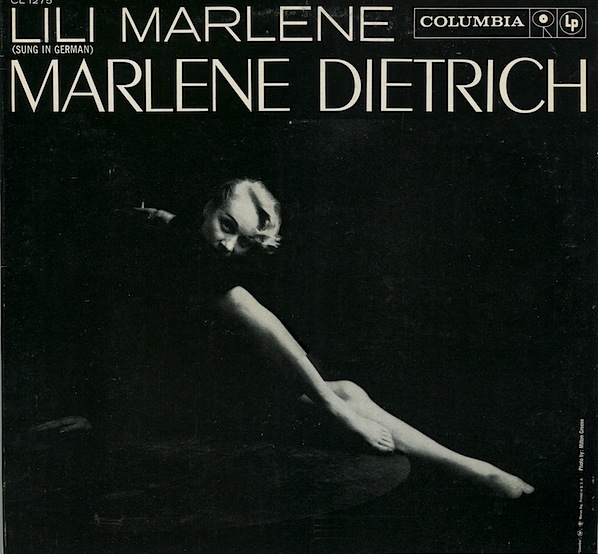 This collection brings to ear all the haubting, nostalgic allure one expects from Miss Dietrich, but, because of the unique nature of the material at the purpose for which these records were made,you will also hear undertones of deep sadness and feeling which represent Marlene Dietrich at her best. 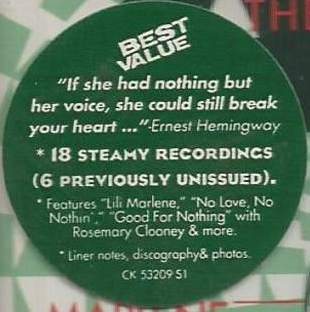 LILI MARLENE: The plaintive song of a soldier who left his girl and knows that someone else is with her now. His fear of dying and never seeing her again makes him remember how he saw her first standing under a lantern, both their shadows melting into oneand her mouth reaching up to his. MEAN TO ME: Be good to me;don’t come to me like a thief at night. My love for you is so far greater than you think. Be good to me; all I have done was to love you and be good to you. ANNIE DOESN’T LIVE HERE ANYMORE: Here the lyrics follow the same pattern as the English words. THE SURREY WITH THE FRINGE ON TOP: A sleigh-ride. Two lovers. A small room at na inn. A fireplace. And tea. Then the lovers drive back to town. Her heart cries because she knows this has been their last meeting. TIME ON MY HANDS: Tell me goodbye, I know your heart hurts like me. The grass grows dry, happiness breaks like glass. All we won melted away like snow in the summer sun. So tell me goodbye. I know it means pain, but the end has come for you and me. TAKING A CHANCE ON LOVE: The moon looks into the valley where the birch-trees grow. Don’t ask me why, my love, we will never meet again. I must go on marching, marching. I don’t know what will happen; all I know is that our song is ended. And the moon will forever look into the valley, and far away, where the hills roll down to the sea, there will be a cross on a grave, red in the setting sun. I COULDN’T SLEEP. A WINK LAST NIGHT: I cried all night long. Why didn’t you leave me alone? My heart was still, and slept, but you awakened it with your kisses, and now I burn with love and know love will not last. There will be pain for me. Why did you wake my heart? THE HOBELLIED: A song of equalization; fate equalizes everything, and it is difficult for men to communicate. Fate alone regulates who will be rich and who will be poor. YOU HAVE MY HEART: You have my heart, you have my soul.You don’t realiza how much I love you. Please try to love me in return. I live only for you. MUST I GO: Must I go and leave you behind? I will return to you, sweetheart, in a year, and we will be married. We belong to each other. YOU HAVE TAKEN MY SOUL: How can I leave you? You have taken my heart, I love you. You know I love no one else. There is a flower called forget-me-not—wear it near your heart.